Make reservations well in advance, especially for holidays. Reservations for the runs and rooms can be made with our pet boarding specialist. Bring the food your pet is used to eating. There are 8 large dog runs, 41 medium & small dog enclosures for client and special needs dogs. Music is played for your pet’s comfort. Dogs are fed breakfast early morning, walked or turned out at least 3-4 times daily in the covered outdoor kennels for potty breaks, then given supper before the doggie hotel closes for the evening. Yappy Hour is @ 3pm and includes treats that you have left for the pets or, “Veterinarians Choice,” treat of the day is given to boarding guests. There are 12 Cat enclosures for client cats that come to board. Music is played for your pet’s comfort. There are fish and bird mobiles, and bird clocks to pacify the cats. 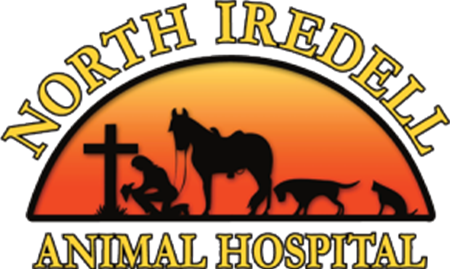 Meows Hour is also @ 3pm and treats that have been left for your pet’s pleasure or treats supplied by North Iredell Animal Hospital are provided for your furry friend. Our boarding facility requires that all dogs, cats and other species are sexually altered. We will not board intact animals in the kennel.